Spanish 3 students completing a written assessment. Because I want my students to be well prepared for higher education study of Spanish, the majority of the performance-based summative assessments I use are borrowed from the thematic units at www.georgiastandards.org The formative assessments, on the other hand, are quizzes I create or modify, informal dialogues, worksheets, postings to the class website, and on-going observations. The unit that we spend the most time on is the Health Science Unit. Since we are at the Lab at Carver, it seems most appropriate. AL 1.1 Uses diagnostic assessment strategies to inform planning. 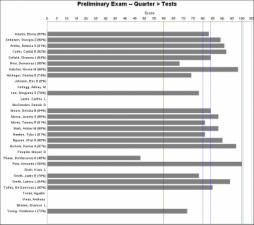 Diagnostic Data (Image is small to protect students' privacy rights). AL 1.2 Uses formative assessment strategies to adjust instruction. Video: Two students presenting a short preterite dialogue about what they did last night. AL 1.3 Uses a variety of summative strategies to evaluate mastery of curriculum. AL 2.1 Uses data to design appropriate, timely interventions. Bulletin board in the hallway with students' "helping a doctor" assessments posted.